Directions: The Ironton Gap historical marker [ Waypoint = N37 36.600 W90 37.771 ] just east of the railroad tracks not too far north of the corner of N Main and Valley Streets. Upon leaving the Ironton Civil War Mural, cross over State Highway 21 and turn left (north) after crossing the railroad tracks. 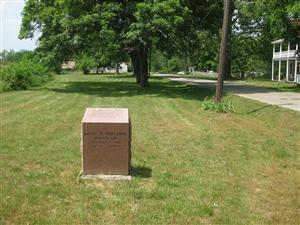 After about 0.1 miles, the marker will be on the left hand (west) side of N Main Street. Ironton Gap, about one quarter mile wide, separates Shepherd and Pilot Knob Mountains and divides Arcadia Valley into northern and southern halves. Through the gap passed the road which connected the villages of Pilot Knob and Ironton. 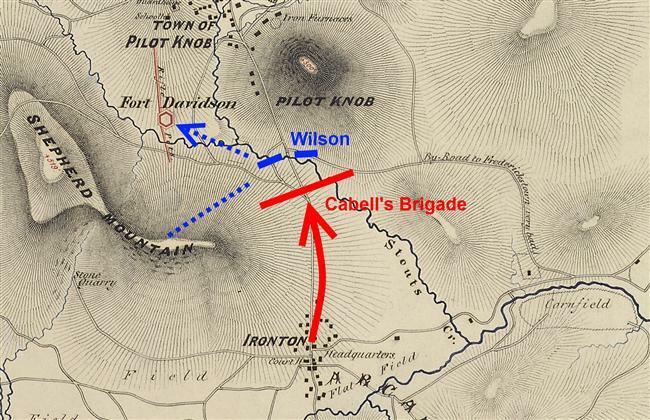 Cabell’s Brigade, positioned in the center of the rebel line, launched three charges on Fort Davidson from Knob Creek which flows through the gap. "Major Wilson was contesting every inch of ground with the enemy and they were pressing him hotly. I could see that it was a matter of only a few moments before he would be driven out of the Arcadia Valley. We were in the direct line of fire of our artillery at the fort, should it open, and not liking my position, I sent my adjutant to General Ewing, requesting permission to take position on a spur of Shepherd Mountain, to our right. He sent back word to do as I thought best. So we marched up through the timber to the crest of the ridge overlooking the Arcadia Valley and formed line. Here I ordered Lieut. Smith Thompson, Co. D, to deploy his men as skirmishers on my right and extend his line up the slope, this being done to prevent a flank movement. The enemy was now in plain sight below us." "A few minutes after the long roll our battalion was ordered to go out through the pass between Pilot Knob and Shepherd Mountain on the Ironton road and reconnoiter the valley toward Arcadia. This we did during the afternoon, and every few moments scouts came in from the front, reporting heavy columns of the enemy coming and only a few miles away … When the morning light came it revealed the whole valley toward Arcadia swarming with troops; and then we knew for a fact that we were in front of Price's army. Daylight set the enemy into activity and soon an advance was made toward the little handful of men facing them. 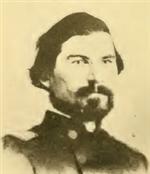 General Ewing ordered Captain Campbell to deploy his battalion of veterans across the eastern base of Shepherd Mountain and on its southern slope. Major Wilson with his cavalry was assigned the duty of guarding the base of Pilot Knob next to the pass, thus leaving it clear from our troops so that the guns of the fort could rake it." "Wilson had been forced back to the base of Pilot Knob and his men were fighting desperately on foot at close range, some using their revolvers. I had deployed sharpshooters in front with orders to open fire, and the latter were now in close action and doing their full duty. The fort was about twelve hundred yards distant to our rear, and as its guns had now opened fire, the space of about three hundred yards between Wilson and my position had become dangerous for us. Shells from the guns burst uncomfortably close … but no one was hurt."